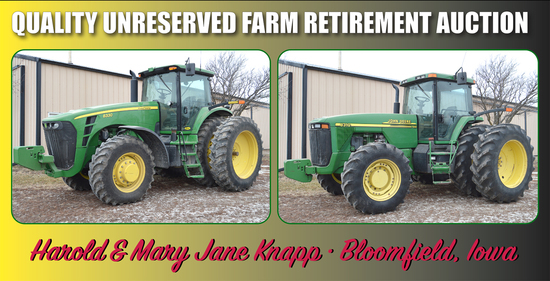 Selling tractors, planter, gravity wagons, baler, mowers and other farm equipment. Driving Directions: From the south edge of Bloomfield, IA on St. Hwy. 2/U.S. Hwy 63 go west 5 miles to U.S. Hwy 63., turn left or south on U.S. Hwy 63 and proceed 1 mile to 230th St., turn right or west on 230th St. and go a ? mile to the auction. The live onsite auction will begin at 9:30 A.M. We will sell approximately 1 hr. of small items. The internet bidding will begin at approximately 10:30 A.M. Thank you.